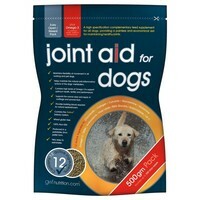 Joint Aid for Dogs is a painless, economical aid for maintaining healthy joints in all dogs. Joint pain and uneasy movement is a common problem in many dogs, especially senior dogs. Joint Aid helps maintain the natural anti-inflammatory actions of a dog’s metabolism, and provides extra support to the normal wear and repair of cartilage, tendons, synovial fluid and joints in the skeletal structure. Joint Aid for Dogs can be fed to all dogs, regardless of age, size or level of exercise. Regular use will help to increase and maintain flexibility of movement throughout their life. First time giving this to my dog and within a few days i saw a big difference in he walking ie no limping.